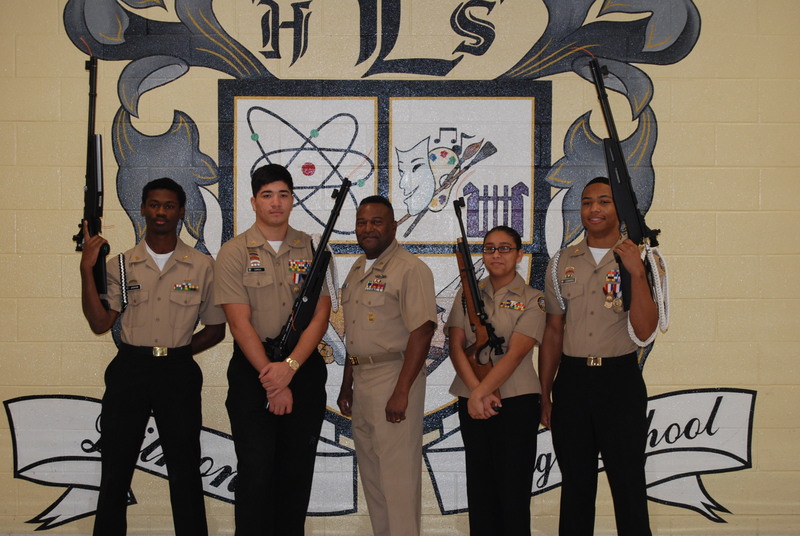 The Lithonia High School Navy JROTC unit was among six teams from the regional rifle competition to qualify for the national Navy JROTC Area 12 Air Rifle Championship, held on Jan. 28, at the Civilian Marksmanship Program Center-South in Anniston, Ala. In marksmanship shooting, Navy JROTC rifle team members must demonstrate self-discipline, self-control and dedication. Lithonia High competed against 29 schools in the regional competition, with the top six advancing to the national round. The Lithonia unit members are Cadet Emon Edwards, Cadet Mehki Jackson, Lt. Commander Kim Woods, Commander Master Chief Dwight Holt, Senior Chief Darrel Johnson, Cadet Lesley Gamez, Cadet Edgar Garcia, Cadet Katherine Orellana.